Piper Cubeba Berry is considered a carminative, diuretic, expectorant, stimulant, and antiseptic. Cubeb Berry has been shown to be effective in easing the symptoms of chronic bronchitis. It is also used for digestive ailments and is effective in treating dysentery. Cubeb Berry also has a local stimulating effect on the mucous membranes of the urinary and respiratory tracts. The herb has often been associated with the reproductive system and has been used to treat cystitis, leucorrhea, urethritis and prostate infections. Cubeb oil is effective against influenza virus and Bacillus typhosus. It is good stimulant of the body organs due to presence of astringent and bitter taste. It has often been used in the treatment of gonorrhea. 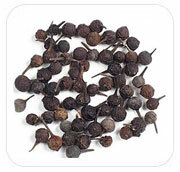 Cubeb (Piper cubeba), or tailed pepper, is a plant in genus Piper, cultivated for its fruit and essential oil. It is mostly grown in Java and Sumatra, hence sometimes called Java pepper. In India, Sanskrit texts included cubeb in various remedies. Charaka and Sushruta prescribed a cubeb paste as a mouthwash, and the use of dried cubebs internally for oral and dental diseases, loss of voice, halitosis, fevers, and cough.